Today's release of the December Producer Price Index (PPI) for Final Demand came in at -0.2% month-over-month seasonally adjusted, down from last month's 0.1%. It is at 2.5% year-over-year, unchanged last month, on a non-seasonally adjusted basis. Core Final Demand (less food and energy) came in at -0.1% MoM, down from 0.3% the previous month and is up 2.7% YoY NSA. Investing.com MoM consensus forecasts were for -0.2% headline and -0.1% core. 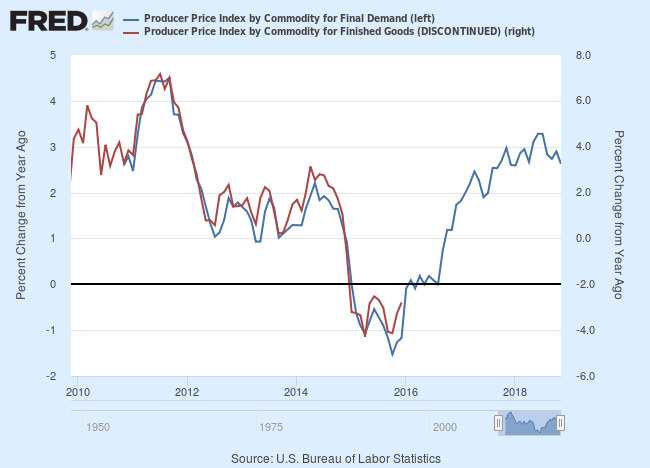 The Producer Price Index for final demand fell 0.2 percent in December, seasonally adjusted, the U.S. Bureau of Labor Statistics reported today. Final demand prices advanced 0.1 percent in November and 0.6 percent in October. (See table A.) On an unadjusted basis, the final demand index moved up 2.5 percent in 2018, the same as in 2017. The BLS shifted its focus to its new "Final Demand" series in 2014, a shift we support. However, the data for these series are only constructed back to November 2009 for Headline and April 2010 for Core. 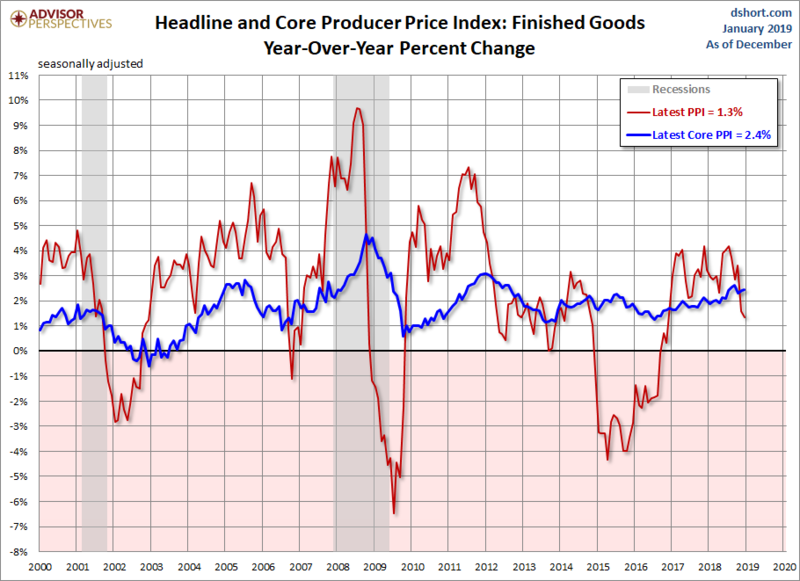 Since our focus is on longer-term trends, we continue to track the legacy Producer Price Index for Finished Goods, which the BLS also includes in their monthly updates. As this (older) overlay illustrates, the Final Demand and Finished Goods indexes are highly correlated. FRED® Graphs ©Federal Reserve Bank of St. Louis. All rights reserved. As the next chart shows, the Core Producer Price Index is far more volatile than the Core Consumer Price Index. For example, during the last recession producers were unable to pass cost increases to the consumer.